My research shows that certain types of Telford property are more affordable today than before the 2007 credit crunch. Roll the clock back to 2007 just before the credit crunch hit which saw Telford property values plummet like a lead balloon and the Telford property market had reached a peak with the prices for Telford property hitting the highest level they had ever reached. Between 2008 and 2010, Telford property values lay in the doldrums and only started to rise in 2011, albeit quite slowly to begin with. Nevertheless, even though property values have now passed those 2007 peaks, my research indicates that Telford property, especially flats/apartments, are now more affordable than they were before the 2008 credit crunch. 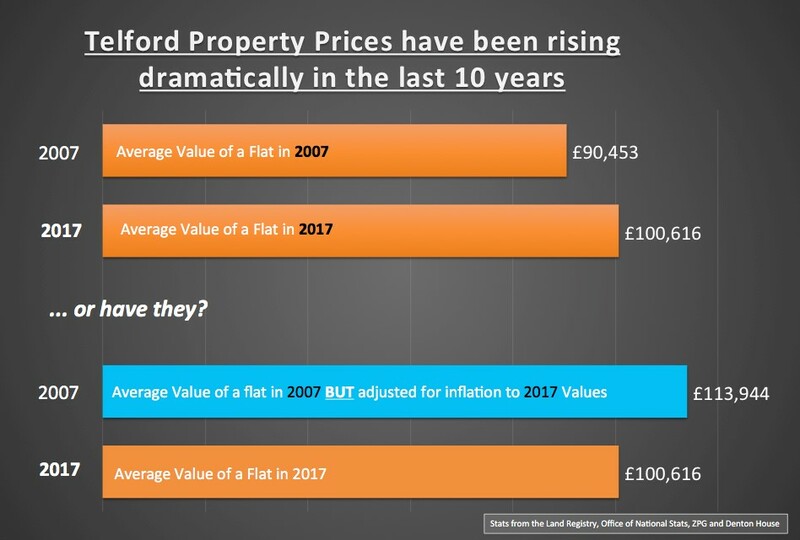 Back in 2007, the average value of a Telford flat/apartment stood at £90,453 and today, it stands at £100,616, a rise of £10,163 or 11.2%. 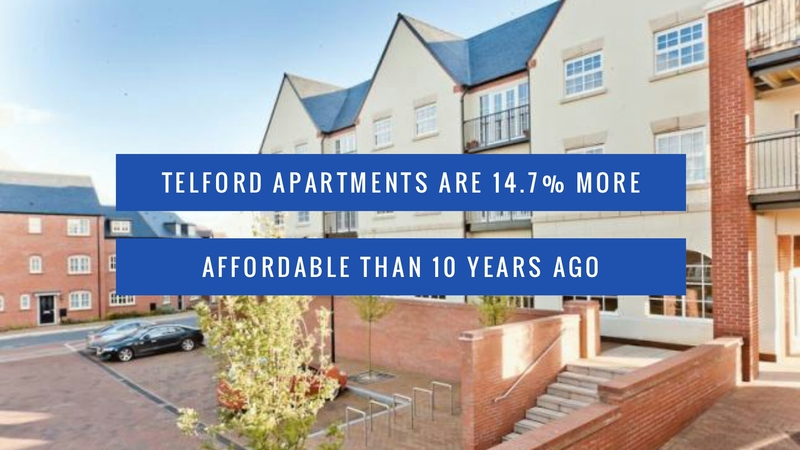 However, between 2007 and today, we have experienced inflation (as measured by the Government’s Consumer Price Index) of 25.97% meaning that in real spending power terms Telford apartments are 14.7% more affordable than in 2007. Looking at it another way, if the average Telford apartment (valued at £90,453 in 2007) had risen by 25.97% inflation over those 10 years, today it would be worth £113,944 (instead of the current £100,616). The point I’m trying to get across is that Telford property is more affordable than many people think. Telford first time buyers can get on the ladder as 95% mortgages have been readily available to first-time buyers since 2010. It really comes down to a choice and if Telford first-time buyers can get over the hurdle of saving the 5% deposit for the mortgage on the property – they will be on to a winner, especially with these ultralow mortgage interest rates, a mortgage can be between 10% and 30% cheaper per month than the rental payments on the same house. So why aren’t Telford 20 somethings buying their own home? Back in the 1960’s and 1970’s, renting was considered the poor man’s choice in Telford (and the rest of the Country) a huge stigma was attached to renting. However, over the last 10 years as a country, we have done a complete U-turn in our attitude towards renting – meaning that many people find renting a better option and a lifestyle choice. Saving the 5% deposit means going without many luxuries in life (such as holidays, every satellite movie and sports channel, socialising or the latest mobile phone – even if only in the short term) therefore instead of saving every last pound to put towards a mortgage deposit Telford 20 somethings choose to rent. There is no denying the simple fact that over the next 10 to 15 years, the people who choose to rent instead of buy in Telford will continue to rise. Therefore, everyone in Telford has a responsibility to ensure that an adequate number of quality Telford rental properties are safeguarded to meet those future demands. Interestingly, what I have noticed though over the last few years are the expectations of Telford tenants on the finish and specification of their Telford rental property. I have perceived that in the past, what a tenant wanted from their Telford rental property was moderately unassuming because renting a property was only a short-term choice to fill the gap before jumping on the property ladder. Before the millennium, wood chip wall paper and twenty-year-old kitchen and bathroom suites were considered the norm. However, Telford tenants’ expectations are becoming more discerning as each year goes by. I have also noticed the length of time a tenant remains in their Telford property is becoming longer (and this was backed up recently by stats from a Government Report), although I have noticed a tendency for many Telford landlords not to keep the rental payments at the going market rates – maybe a topic for a future article for my blog? The bottom line is this … Telford landlords will need to be more conscious of tenants needs and wants and consider their financial planning for future enhancements to their Telford rental properties over the next five, ten and twenty years – e.g. decorating, kitchen and bathroom suites etc etc .. The present-day and future situation of the Telford private rental property market is important, and I frequently liaise with Telford buy-to-let investors looking to spread their Telford rental-portfolios. I also enjoy meeting and working alongside Telford first time landlords, to ensure they can navigate through the minefield of rental voids, the important balance of capital growth and yield and ensuring the property is returned back to you in the future in the best possible condition. 13.4% of Telford and Wrekin is Built on … Building Plot Dilemma or Not?Youngsters unable to buy their first home in Telford – Are the Baby Boomers and Landlords to Blame?